Your kid’s birthday party does not have to cost you a fortune to be fun and memorable. What?! A $10,000 Princess birthday party? What about that $6,000 Harry Potter reenactment? I was outright floored and shocked to read about how some kids’ parties were being done these days. Apparently, there are typical middle-class parents out there who do feel that money is no object when it comes to their little ones and feel compelled to have Disney characters in all their splendor attend their unforgettable jubilee. I’ll be honest. I want that baby elephant in the park too, and the guy in the unicycle to pass around the hors d’oeuvres, but really, what message does this send out? Nevertheless, I can somewhat understand the motivations these parents have for the out of this world party experiences. Why Do Little Kids Get Such Big Parties? Parents want to preserve delightful memories of their family. Kids are only incredibly cute and little for a certain period in their lives. So why not savor it for as long as you can? They also tend to appreciate their parties most when they are young and tender, so parents are eager to capture the special milestones in the best circumstances they can muster. That usually means paying up to deliver and create special moments that their families can keep enjoying and reliving in video. They want to keep up with the Joneses. Did you see that circus theme in your kid’s preschool classmate’s bash the other day? Well there’s that pressure to return the favor to other parents by presenting something just as (or even more) spectacular than what you’ve just witnessed. It comes with feeling like you need to play with the herd or risk being left out of the “in crowd” comprised of fancy party hosts. It’s also a parent’s social, not just a kid’s party. Kill two birds with one stone and combine the kid’s party with active socializing with other children’s parents and other adults. How many times are these parties just an extension of our own childhood where we get to relive our juvenile dreams all over again? C’mon admit it. Do you think to yourself: I wish I had a bird show and fire swallowing acrobats during my birthdays as a child, so I’m having them now! They’ll do anything for their child. Kids are only young once and they grow up so fast (*sniff*). So mom and/or dad think, why not indulge them a little? Birthdays only come by once a year so let it be a blast. In contrast, a few weeks ago, we celebrated my child’s birthday party with the usual mob of family and friends. It was a great success with much food, fun and talk to go around, but what was particularly great about it was that this time, it was even more affordable than it ever was. How elaborate do I want this to be? What kind of food should I prepare? What form of entertainment should I have? The answers to all these will tell you how much you’ll eventually end up spending. When I first embarked on such projects as a newbie parent, I didn’t really know what I was doing. I didn’t think of a budget first but rather who I thought should be in the party. After all, I couldn’t avoid inviting my relatives to this event. If I had one family coming over, the rest would have to attend as well. So I had no say as to the size my parties were to be. That is, I had no control over my guest list. It’ll remain at a solid 40 people every time, no matter what. I can, however, control the rest of the party ingredients. And that’s what I strove to do. In the past, I easily spent $500 a pop on each party. I made the mistake of even trying to outsource the event planning aspect of it when I found myself short on time with the desire to make some spectacle of the event. I realized later that it was a ridiculous idea, especially when I found that kid’s party event planners were asking for my entire budget as their fee alone, when in fact I had within my power and ability to do exactly what they could do, if not better. In the end, with many gatherings under my belt, I have refined the routine of preparation and now know how to whip up a decently priced get-together. And this last event, I easily cut my costs by HALF, basically by replacing our hired clown and magician entertainment with children’s videos and outdoor games. My kid is a Cars fan so his party was themed just that, and we had the Cars video show for the children to enjoy. The rest of the fun and games were out in the yard with the requisite toy box raids indoors. Your guest list will dictate how large your party gets. It so happens I am unable to really control this one factor in my own parties, but you may have a different situation. So start out with the list and a budget and see if you can manage it somehow. Hold the party at your own house. If you host your own party at home, then you’ll save on the cost of paying for a recreation center or outside entertainment spot for the children. Renting a place out can be in the hundreds of dollars so keep this cost in mind. But if you have a small place and you’d rather not tidy up, then maybe visit a local pizza parlor or Chuck E. Cheese for the festivities. Set up an arts and crafts time as alternative entertainment. If you check out the party supply catalog these days, there are tons of crafts you can get for good prices. This may be a nice form of entertainment for children. I normally look into the Oriental Trading catalog for affordable souvenirs, toys and crafts to give away during parties. Don’t overdo the favors, souvenirs and party decor. It’s up to you whether you’d like to theme your parties and how to present them. If you’re creative, you can create your own designs and themes on your own, otherwise you can visit party sites for fun ideas. Some sites are better priced than others, but availability of inventory also varies across sites. Cook your own food, bake your own cake or get them all from Costco! Again, it’s your time and energy versus the money you spend picking up ready made dishes. The last party I attended had deli sandwiches and simple Safeway cupcakes to give out instead of a catered table with a large custom birthday cake. Also, serving drinks from large bottles, rather than individual containers and offering items from bulk containers may be more economical. Make your own invitations and thank you notes. People will probably appreciate the personal touch of a handcrafted invitation or thank you note. I certainly would! Get your supplies from discount stores or use coupons whenever possible. Since I’m a regular customer at several such stores and events places, I am able to snare great discounts for future parties. In some cases, by referring and recommending friends and relatives to these places, along with my repeated business, I have been able to negotiate better prices for later events. I’m going to bet that if you arm yourself with a camera and camcorder, and capture your gleeful moments during these parties, you’ll realize that even without the Pirates of the Carribean coming to battle in your backyard, everyone there, especially your kids and their playmates, will still be found smiling from ear to ear. If you don’t mind organising lots of kids, then traditional party games go down really well as they’re not done as often as they used to be. I mean things like pass the parcel, pin the tail on the donkey, musical chairs etc. I should try some of these games at some point. Haven’t gotten there yet. Somehow things always turn into chaos at our place whenever a party strikes. But it’s been lots of fun! It’s the prep up and clean up afterwards that I’d consider work. Here via the Sunday Review #10. Great post. You may be interested in the WSJ article about the cost of raising kids, in the March 3 edition. There was some discussions about lavish parties. In addition it shared the range of cost for raising kids – $279K Govt estimates to $1.6M “platinum” level. Thanks Super Saver, wow, even $279K is a lot to raise a kid here. So if you have 4 kids you’re going to spend over a million? Amazing. Here from the Carnival of Family Life. What a great post to include! I threw a tea party for my daughter’s 7th birthday that was incredibly inexpensive. We put sheets over the dining room table and brought out the nicer tea service. Food was all homemade and appropriate to the theme. We did a craft of glueing ribbons and flowers to purchased doll straw hats and the girls kept their crafts as a favor. The big winner was that we gave out doll sized tea sets from the dollar store wrapped in pink paper as their parting favor. I still see the tea sets on display at the different girls homes. I have found that the best memories I have don’t center around parties. I do remember my Grandma’s birthday cakes each year and that is special. My kids have loved their parties and I’m so NOT a big spender. I do most everything I can myself from invitations to cakes to decorations and thank you notes. It means more when it comes from you. Great post. Another thing to cut down on the “theme” idea even more, just buy one or two items with the theme printed on it, and buy the rest in a color that coordinates. For example you could buy “cars” plates, then just buy balloons, paper napkins, streamers, etc etc etc in red and black-way cheaper than buying everything with “cars” on it. Thanks for all your wonderful suggestions. These are great notes for the next bunch of parties in our horizon! im having a joint birthday party with my best friend. We dont have alot of people in our grade,(about 40) (and we’re inviting a couple of our teachers to stop by and have some food, cuz our school is like a little family) So the budget is around $1500. We want to go all out. i mean not like brats on my super sweet 16, but like her family~~ umm $$$$$$$$$$$$$… ok so… we’re gonna have a DJ, and our party is right on the beach, with a huge bonfire. i need suggestions!! please! the theme is hollywood. anything! Great tips! I’m always looking for new ideas and cost cutting measures for all those kids events. One year we had a treasure hunt party where the kids had to go around the neighborhood and look for clues to the treasure. Lots of work-but it was a hit! I’m gearing up for another one in a few weeks and while surfing the internet, came across http://www.party-magic.com -a cool party sight with all sorts of supplies. Enjoyed these tips! Glad I found you! From the office of “Kill two birds with one stone” and “Make your own invitations” comes photo cards by Scrapless Press Innexpensive photo birthday party invitations with a personalized, handmade look. I have two kids, age 2 and 4. In my family, it was normal for a birthday party to involve cake, presents, and kids running around playing. Not organized games, not even necessarily decorations, and certainly not gift bags. I tend to stick with that. My big expense at birthday parties is fruits and vegetables. I make hot dogs, maybe a salad (e.g. macaroni), and then cut up fruits and vegetables (in an effort to provide healthy alternatives). I also get a couple bags of snack food (e.g. popcorn twist and pretzels) to have on the table for snacking before the food is ready. I do not buy themed stuff, although I did get party hats one year, but I don’t see that anyone cared much one way or the other. I buy my paper plates and cups in the large packs at costco, and that is what we use. Honestly, the kids are running around playing and some of them barely sit down to eat — who cares what the plates look like? We always have a fancy cake, but that is because I enjoy decorating cakes and I have all the stuff to do it myself. If I didn’t, I would just bake a cake, ice it plainly, and stick on the candles (which is what most other people I know do). If you aren’t into fancy cake decorating, an easy way to decorate is to put a couple toys on it. Maybe ice it green with a brown strip down the middle and put on a couple toy cars. Or all green and put on farm animals (I’ve done that). I do not give out gift bags, although one year I did buy a bunch of the glow bracelets at the dollar store (99 cents for a pack of three or something) and gave each kid a pack of those. Again, don’t think anyone cared much one way or the other. The thing about gift bags is that they are usually filled with candy and dollar store trinkets. My kids get lots of candy as it is, and dollar store trinkets are, well, mostly junk — fun junk, but junk — and we have way too many toys as it is. So I LIKE it when they don’t get gift bags. The one thing they got that I actually thought was cool was a helium balloon. My cousin had gotten them for decorations, and each kid got to take one home. Fun, the kids were thrilled, and a day later, it could go in the garbage. We don’t do inviatations, just phone or email. Here is one of the best things I have done: I have a lot of cousins, and so we will end up at each other’s kids’ birthday parties. This year, when people started asking what my kids wanted, I sent out an email to everyone saying that my kids have LOTS of toys without ever getting another one, and anything that we think of that the kid would really like is pretty much going to be what we buy for a present. Therefore, they don’t really need anything else (and between the grandparents and a few of the aunts and uncles, they are going to get lots other toys anyway). So I said I wanted to start the trend where you are welcome to come to the party and NOT bring a present, and if they really felt they had to bring something, to keep it UNDER $10. Under $5, if possible. My suggestions were things like sand toys (which have the benefit of going OUTSIDE and some of which get lost or broken every year, so they are always useful), or crayola washable markers or a watercolour paint set (both should be under $5), or a ball (the perfect present), or just their age in money (e.g. $2 for the two year old) because they love putting money in their piggy bank. Age in money has been one of my best presents for a long time because it is cheap for me, and I remember my godfather sending me a card every year with my age in money, and I LOVED it. Even when I was 16, I loved getting a birthday card with $5 in it. I think I even told someone that the kids would go crazy over the one dollar can of silly string (and that is what he brought, although he kindly brought 2 cans so both boys would have one). There was a really positive response back — I think most people were really happy to have someone come out and say this. When my kids start school, if it looks like we are going to start getting sucked into an invite everyone in the class thing, I am going to suggest right off the bat that we stick to cheap presents or no present parties. I am working on my kids to help them realize how rich we are compared to most people in the world, and what I would LOVE to see is for them to pick a charity for people to donate to instead of presents (because they will get enough stuff from us). Thanks for sharing this with the Carnival of SAHMs! Thanks for the tips. My kiddos are still small, so we’ve been able to forego the party favors and games/crafts–their parties have been more like mini family reunions. My oldest son’s first birthday was fabulous, and we were flat broke at the time. I made a giant pot of chili, pans of homemade cornbread, and the cutest train cake you ever saw! We used a Baby Einstein theme, but alternated the decorated plates/napkins with plain red and yellow–nice, bright, and cut the cost by 2/3. Old fashioned crepe paper in primary colors and bunches of balloons (not helium) attached on every available fixture and to several bright stuffed animals brightened our home. I had taken my son’s picture every month since birth; I strung the 8×10 photos on a wide yellow ribbon above the food table so everyone could ooh and ah about how much he’d grown. We also served fresh fruit and veggies, bowls of kid-friendly M&M’s, Goldfish, pretzels, and animal crackers. Iced tea, coffee, and homemade lemonade for drinks. Over 30 adults and half a dozen kids attended. The whole shabang cost us less than $50. I am the cheapest of all cheap. We are having my sons 6th birthday party soon. For parents who want a Western theme for their childs party on a dime here’s an idea.I went to a local farmer and asked if I could have his party on the farm. He agreed and at NO COST. We are serving hot dogs, chips,baked beans, etc.. I have purchased brown twin sheets to go over the tables, from a dollar store.I purchased several yards of cheap rope from the local feed store to play snake games and trail walk. He has a donkey on the farm that the kids can ride. Also we are giving the kids helium ballons for favors. We bought a boot shaped cake pan and baked the cake ourselves. There are huge fields the kids can just run and play in, so it’s not tooo organized with games.We are also letting the kids do a treasure hunt with the rewards being a horse ride. For invitations I made WANTED Posters by hand burnt the edges and copied them on beige paper. My son handed out his own invitations so he feels he has part in planning and no postal fees for me (win-win). I also bought blue napkins,red plates and brown cups for a discount party store. I have called around to other farmers and at the most our rental fee would be 100.00 on a modern farm and at the least nothing from an independant farmer. Call around do some leg work and save a bundle. On the table we are going to have a farm jar for donations if people want to donate to the farmer for letting us enjoy his farm at no cost and providing our family and friends a life time of priceless memories. Enjoy nature with your kids and you both may learn a little. We own a decent apartment with a balcony but arranging a birthday party for my elder son and inviting 50 kids seemed like a huge task. My son’s PR skills are improving day by day and with every passing year, he keeps adding 10 super geeks in his contacts diary. I have given him free access to our PC and we parents keep a distant watchful eye on the content he is accessing. He got good grades in school and so we couldn’t refuse his polite demand for a gala party at his birthday. So we arranged it on our building’s terrace. All of the building residents are cooperative and did not object. After some welcome snacks, the event organisers started with the cotton candy making demonstration and all the kids spread the ‘cotton’ all over their body and smeared it over their face making them look like 50 little goblins. Their parents must have cursed us for this but the kids enjoyed and that was more important. The little goblins then were led to a ‘fountain of youth’ which was like a cascade of green coloured glowing water. When the magical creatures had a full exposure to this water body (had all the candy cotton removed and got themselves neat and clean with the help of their parents), they were ready to enjoy the fireworks with each of the kids imagining himself as a Ben 10 or a Pokemon’s master with the same supernatural powers. The organisers simply went on and on with their super entertainment. They ended the show with a puppet show. By that time we were into a different world full of magic and had forgotten about our woes of owning a bigger house. The terrace had been transformed into a Harry Potter’s Hogwarts. I have decided one thing and that is I am going to call the Mad Science people again for my younger kid’s party as well and all are invited. I noticed currently the kids parties go more and more with those big inflatable bouncer things. And you know, here is my thought over it. The kids really love something big right? So those bouncers are really huge and are to be explored by the kids which will take them long time to get enough of it. I have shopped around and found out the rent for a bounce house for a day is around 70-100$. I have found a website that i really loved, and it has a tool to help you find a rental company near you – all you do is type in your zip code and it brings the rentals near you. Then you choose the ones you want to contact and send them a message or call them. The tool is at http://www.bouncerland.com/findrental.php so you can go look. Fantastic! I just discovered last year how BIG a hit those inflatable bouncy things are. And they are some of the cheapest entertainment you can get for a large party! I love your suggestion and thank you so much for sharing this with us. I am no doubt going to be checking it out and scouring for more bouncy options available. It is so popular in our neighborhood right now — I can’t escape riding around our area noticing the squeals of kids and those things peeking up behind the trees. When I rented one last year, the parents were so thrilled because it was so easy. The bouncy castles, etc were like yard baby sitters (we had a few grown-ups rotate to keep an eye on the kids) while everyone else enjoyed chatting and catching up during the party. Where I live, I remember paying between a hundred to two hundred dollars for renting it for almost the whole day. We own a party website and we know exactly where you are coming from. It seems in a kids’ party, there is a never-ending list of must-buys and must-haves, before you know it the cost is through the roof and you haven’t even brought the cake yet! I think you have to plan your party first, chose exactly which particular theme you are going with, which one will be easiest to run in your surroundings and then go ahead and order! But you are certainly correct, a party does not have to be expensive to be worthwhile or successful. We supply cheap party supplies and we regularly receive support and thanks from our customers, many of which spend a very small amount on products in the first place. I fully recommend going with a themed party. You can choose from a pretty much unlimited selection and for argument’s sake lets go with Cowboys vs Indians – You can buy Scene Setters, Inflatables, Tableware, Disposables, Cardboard Cutouts, wall designs etc to really re-create the theme. Best of all, it’s all completely affordable and the quality looks fantastic. Running a party website as we do, we fully suggest buying online, it’s less hassle, the price is always cheaper and lets face it, it saves time. Ed: We don’t allow advertisements in the comment section. If you’re interested in advertising, please check the contact form to get in touch with us. Thank you! Trying to pull off a kids birthday party at a low cost is certainly possible. Now, hosting a kids birthday party and not getting worn out is a challenge. These days, my family and I have been looking for ways to save money any way we can. We have a big family, and my daughter is actually getting married soon. We found some really elegant and low priced wedding invitations and a great band as well. We are still looking for a professional wedding photographer though, any recommendations? 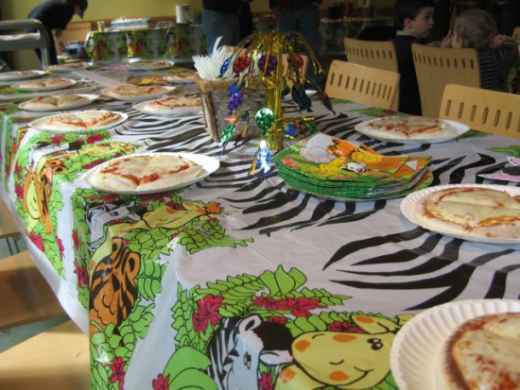 These are great tips for kids parties – a great post with a lot of excellent replies. I have found that choosing a theme and balancing everything around that really helps with the party planning, and you certainly don’t need to spend a fortune to help ensure everyone (birthday child included) has a great time. It really is the fun they remember, not whether you had all perfectly matching tableware. Plus, the dollar store is a great place when it comes to saving money and being creative. My daughter is a March baby, and four years ago (I think it was the 13th b’day party) I planned a Spring theme birthday party. We found these great wooden bird houses at the dollar store, bought paint for them and that was one of the crafts everyone enjoyed during the party time. oh. wonderful post and I specially liked the “Why Do Little Kids Get Such Big Parties?” part which is a good psychological explanation of the birthday tradition. One idea that could help, is to make a wish list, which will be sent out to friends attending the birthday. This will make it easier for the people who plan on bringing a gift, as well as ensure your kids get the things they want, and you don’t have to spend a dime. I don’t really find much sense to the comments above, I know it is good to save money, but when It comes to your kid’s birthday parties, I think you should make your best, not at overspending, but keeping in mind that the people who you invite isn’t just going for a slice of cake, the best suggestion is, if You can’t afford a party, just get a little get together with family, and another awesome suggestion would be avoid buying the six or 12 pack of Miller’s lite or whatever beer you buy, and use that money to make something decent,It kinda makes me sick to hear a bunch of stingy parents talking about extremely ways to save a couple of cents, remember It’s yur kid’s birthday celebration! You don’t need to spend thousands to make it nice, but it doesn’t mean you are going to be that stingy!!!! When I was a kid, my mom used to bake a cake and make a pinata every year. I looked forward to it so much and after the big day, I was fully thrilled just to have a lot of sugar and my best friends around. Thinking back, it had to have been pretty cheap – especially compared to the ridiculous parties above. Pinata – blow up a balloon and hang it from a string. make a mixture of flower and water in a big bowl so it’s like a paste. Tear strips of newspaper. Dip in the paste and apply to the balloon. Add 6-8 layers (depending on how strong your kids are). Let it dry (usually overnight). Spray paint with something that will make your kid happy – Sponge Bob, perhaps? Let dry. Cut a hole in the top and fill with candy so it’s ready for kids to hit on B.day! Fun to make and fun for a kid’s b.day! I just threw a birthday party for my own little one and it did not have to cost an arm and a leg and let me tell you, he had lots of fun with his friends and festivities. My daughter just celebrated her 6th birthday and she had 13 little guests. My husband says that we had 5 too many kids and and extra hour too long. I think next year that we won’t have so many kids. That should cut down on the expenses. At least we did it in a big way once. My only rule is that I don’t mind spending a little money as long as its out of my house, but I won’t go extravagant. I get too stressed out having it in my own house. My son loves cars too. these are some great tips for his upcoming 3rd birthday. Something we’ve done, we eliminate buying them gifts and let them pick a friend and let them pick something to do with that friend. Our daughter picked to go to build a bear with her friend from church and so she got to hang with her friend, get a bear and enjoy an experience. I think that’s better then just getting a pile of gifts. I don’t understand why kids parties have got so expensive, when I was little (not that long ago! ), it was sandwiches, jelly and ice cream, pass the parcel, musical chairs, and sleeping lions. Oh and of course a big piece of the birthday cake. Now it’s how many kids, what venue, what to put in the party bags, what entertainer to hire, how many tiers for the birthday cake – oh but it can’t be cut, so have an extra cake already cut and put in the party bags ………madness! . . . .. . . . now tell me that children have done this? no way! it’s got to be down to parents and ‘outdoing’ each other, isn’t it? This is a great post. I am all for not spending a ton on birthday parties. This year I had my teenage son and his friend dress up as pirates and they did “Pirates in the Park” games and pirate training. I made a pirate ship out of a watermelon, ordered some pizzas, found some pirate swords, goodie bags, balloons and decorations at the 99 cents store and painted the kids faces (it so happens that I am a face painter). Oh, and we had a pirate pinata. The kids had a great time and I think I spend about $75 at the very most on everything). I just had a combined party for my two oldest boys and tried to watch my spending, but when all was said and done, I feel like I spent a fortune. Now my youngest is getting ready to turn 1 and I’m going to try to be a little more careful on spending. Thanks for these tips! As I write this we are hosting a High School Musical party for our 3 daughters and about 10 of their friends, lots of pizza and ice cream. Wow, I love your ideas. Fun and memories are not bought, they’re made. I love kids’ birthdays too and am into making cakes and planning parties. I have always opted for home parties for my five kids and have learned a lot in the process about planning out parties. For more cake and planning ideas you can check out my site. i think this is bogus! i just realized i spent a lot of money and i don’t need to, on my child’s last birthday which was in the start of May. My husband and I spent $6,000 on my little girl’s party. I guess i didn’t know i could spend much less and have it be a great party! this really helped, thanks sooo much! I believe there are a ton of creative ways to throw. Great party on a serious budget. We are throwing a medieval party for my son turning 4 and my daughter turning 1. (princess and knight). We are making almost all of the decorations ourselves. We went to the dollar store and purchased poster board and painted shields on them and made crests on them to hang up in our living room. My son helped with EVERYTHING! I went to my local fabric store and spent $10 bucks on some felt in purple and green and also picked up some fabric paint. I used this to make chair covers and painted my kids names on the back, these worked as their thrones! Again another project my son helped me on. I know he’ll be so proud to see all the decorations hanging up that he made. Also my husband loves to draw so he’s makig their birthday banner with their names on It also. I purchased goblet style ups from OrientalTrading.com which has been invaluable in planning my little ones birthdays over the years. Gold paper plates and cups, purple and red streamers along with a red table cloth create a perfect medieval affair. A great birthday can be done on a budget just be creative and get your kids involved! Good luck! I wish i had the kind of money to go all out for birthdays like that.. It only makes sense to do it yourself and save money, especially in an economic downturn like we’re experiencing now. Homemade means made with love to practically every kid. Your time and effort are priceless. Thanks for sharing this! Thanks for sharing your great ideas about kids party with us. It’s a nice idea. Really throwing a birthday party for your kid is very special for their parents. It will become great memory for their parents.Its a memorable moment. Birthday comes once in a year so it should be special. I am going to throw a birthday party for my 4 year old kid so i just read your blog and i am quite confident about organizing a great party. Thanks so much. God bless you. Based on how I see it, you surely saved a lot of money from throwing a simple party like this. Actually, spending great amount of money is not a requirement to have a great party experience. It’s the thought that counts. It’s funny how dramatically different the cultures are for how to treat children. I used to work for LEGO and European kids and American kids are poles apart. Throwing huge expensive parties is not how its done over here — the cheaper more down to earth way is definitely the right way as it doesn’t send the children the wrong message that they can have everything and money is no object. Watching some of those ‘my sweet 16’ programs just makes me cringe! How To Cut Costs On Hair Care Once and For All!